In my latest broadcast for Australian ABC Radio’s “Ockham’s Razor” programme, I reveal how (and why) Galileo calculated the dimensions of the roof of Dante’s Hell, and how this led to his discovery of the laws of mechanics that engineers use to this day (Hint: He messed up the calculations first time round, but never let on until he had found and published the right solution late in life, when under house arrest by the Pope). Just don’t blame me if you don’t like the answer. I want to talk to you today about the scientific significance of Dante’s Hell – the one that the fourteenth century Italian poet dreamed up as the setting for the first part of his Divine Comedy trilogy, which was called Inferno. Dante imagined Hell as being a hole in the Earth in the shape of a giant ice cream cone, with the tip at the centre of the Earth, and covered by a vaulted roof that was a part of the Earth’s surface itself, fitting like a layer of chocolate on top of the ice cream. The space below the roof was divided into nine levels, with the deepest ones being reserved for the worst sinners. The academic and church establishments of fourteenth-century Italy took Dante’s picture of Hell literally. The Florentine academy even asked the young Galileo to calculate its exact dimensions, based on Dante’s description. It was a great chance for the twenty-four year old, and he set to work with a will. We still have the transcripts of the two lectures where he announced his results. They are well worth a read, and far clearer than a lot of today’s scientific papers. They also turned out to be a stark warning of how the literal interpretation of a piece of poetic imagery can lead to the most absurd results. Jerusalem with its highest point”. But how wide was this meridian circle? How big was the ice cream? Galileo used a clever geometric argument to prove that Dante’s description of the Sun being “joined to the horizon” meant that the diameter of the circle must be equal to the radius of the Earth. This meant that the boundary of the roof would pass through Marseille in France on the Western side and through Tashkent in modern-day Uzbekistan on the East. That makes the roof of Hell a pretty big dome – but then, it had to be, to accommodate the present and future inhabitants. Galileo’s next problem was to work out just how thick the roof would have to be to support its own weight, rather than collapsing and crushing the captives beneath. This is where he had another bright idea, because he knew that Brunelleschi’s famous dome on Florence Cathedral, which is still standing today, was 45 meters wide, but only 3 meters thick. By scaling this up, he worked out that the roof of Hell would have to be around 600 kilometers thick. Galileo soon realized that he had made a fatal mistake in his calculations, but by the time he came to his realization, his erroneous mathematical picture of Hell had landed him a job as a lecturer in mathematics at the University of Pisa. Rather than admit his mistake, and perhaps lose his prestigious position, Galileo kept his mouth firmly shut, and continued to think about what the correct solution might be. He didn’t keep his mouth shut about other things, though. The story of how he came publicly to oppose the church’s view that the Earth is the centre of the universe is well-known, as is the fact that his opposition landed him in serious trouble. Even after his death the Pope blocked plans for a public funeral and a monument in the church of Santa Croce. Instead, his remains were interred in the basement of the church bell tower. All that remains of Galileo now is the bony middle finger of his right hand, mounted upright on a small alabaster plinth, as though in defiance of the Pope. You can see it at the science museum in Florence, just behind the Uffizi art gallery. 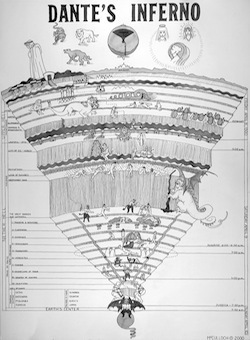 If Dante’s image is correct, the rest of Galileo’s now nine-fingered body resides in the sixth circle of Hell. This is the level reserved for heretics, which Dante defined as people who exhibited untoward “intellectual stubbornness,” especially in the face of religious belief. You can find out which circle of Dante’s Hell you may end up in yourself by doing an on-line quiz. I tried it on myself, and was quite pleased to find that I belong in the sixth circle, along with Galileo. It’s quite warm here – in fact, the inhabitants are encased in flaming tombs – but the company’s good, because when I used available biographical information to test a range of other scientists and philosophers, most of them ended up here as well. The Greek philosopher Aristotle is around here somewhere, and I want to ask him how he came to the conclusion that men have more teeth than women. I suspect that it was because he believed that men were superior to women, and therefore must have more teeth. It made sense, so it had to be true. He was married twice, yet he never actually bothered to look, preferring to believe argument over observation. Now that’s real intellectual stubbornness. Another thing that made sense to Aristotle, as it still does to a surprising number of people, is that falling objects would have a ‘natural speed’ that depended on their weights, so that heavier objects must fall faster than lighter objects. It made sense, so it must be true. Why bother to look? And nobody did look for two thousand years, until Galileo came along. Galileo checked out Aristotle’s idea by dropping different size cannon balls from a tower. He never revealed which tower it was, only that it was around 90 meters high. It certainly wasn’t the Leaning Tower of Pisa, because this is only 52 meters high. It could have been the Campanile di San Marco in Venice, but even in those days St Mark’s square would have been crowded with tourists, and they wouldn’t have relished the prospect of cannon balls plummeting from the tower above them. Maybe this is why Galileo kept quiet about the exact location of his experiments. In any event, Galileo established an approach to science that has held sway to this day – that of stubbornly checking out your beliefs against reality. I think that this is about the best definition of science that I know. It is certainly one that the philosopher Bertrand Russell would have approved of, and he is another inhabitant of the sixth circle. If a few more of our politicians accepted this approach, and had the intellectual honesty to check out their beliefs against reality, the world would be a better place. At the least, they wouldn’t be risking the fate of many of the politicians of ancient times, which was to end up in Dante’s eighth circle, immersed in a lake of boiling pitch. There was only one worse fate, and that was to end up in Dante’s ninth circle, stuck in ice up to their chins – an image that is rather at variance with what we now believe to be molten state of the Earth’s core. Dante reserved this circle, the innermost one, for traitors, which is what the makers of the recent film The Imitation Game claimed the Enigma code breaker Alan Turing to be, on the basis of no evidence whatsoever. If I had my way, the film’s scriptwriters would themselves be condemned to the ninth circle for betraying Turing’s memory. Even if you know little of science and mathematics, you can get the flavour. It is a flavour that Galileo would have appreciated, although the differential calculus was not invented by Newton until after Galileo died – in fact, Newton was born on Christmas day in that same year. Galileo would especially have appreciated the differential calculus because it might have helped him to avoid his second biggest mistake. His biggest mistake came when published his ideas about a heliocentric universe in his Dialogue Concerning the Two Chief World Systems. It was cast in the form of a discussion between a character called Salviati (this was Galileo himself), an intelligent layman called Sagredo, representing the sort of person who might these days listen to Ockham’s Razor on ABC Radio National, and a dull-witted respondent called Simplicio, whose unthinking opinions Galileo was concerned to squash. Galileo wasn’t completely without political nouse, and he accepted the directive of the church authorities to describe his heliocentric notions as a ‘hypothesis’, and to incorporate the opinions of the Pope in his dialogue. Where he made his biggest mistake was to put the Pope’s opinions into the mouth of Simplicio. Galileo was asking for it, and he got it, in the form of house arrest for the rest of his life. While he was under house arrest he wrote his other famous book, called Dialogues Concerning Two New Sciences. Here he returned to the problem of Hell, and finally admitted publicly to his second-biggest mistake – that he had got the scaling wrong in his earlier calculations. He had originally assumed that the width and the thickness of the domed roof of Hell could both be scaled up in the same way – when the width doubled, he thought, the thickness would also need to be doubled. It seemed to make sense at the time, but now he admitted that he was wrong, and that the thickness would have to increase faster than the width to maintain the strength of the structure. The rule that he worked out was that the cube of the thickness divided by the square of the span needed to be kept constant. This is known as Galileo’s square-cube law, and it is still used by engineers today. It shows that objects like beams and roofs need to become disproportionately thicker as they become larger if they are to maintain their strength. It even applies to animal bones, and explains why there is a limit to the size of animals, since above a certain size their bones would have to be impossibly thick to take the weight. And this is what happened to Hell. When Galileo repeated his calculations using the square-cube law, he found that the roof would have to be so thick that there would hardly be any room underneath to accommodate all those dead souls. He didn’t tell anyone about his mistake at the time. That might have cost him his reputation, and his job. Only at the end of his life, when he was under house arrest, did he write it all down. In doing so, he turned the problem of Hell and its dimensions into a foundation for modern science. The very existence of Hell is, of course, still a bone of contention in some quarters, although if we use Galileo’s square-cube law, there is a limit to the size that the bone can attain. In any case, I can imagine him roistering away down there, just as he often roistered in real life, enjoying the company of all those others whose honest intellectual stubbornness has condemned them to the sixth circle. Without them, the world would be a poorer place, dominated even more by the thinking of bigots, dogmatists and members of the anti-science woo-woo brigade, all of whom would rather stick to their beliefs than face up to checking them against reality. I offer you a toast to their courageous opponents, who have too often been seen as heretics, and even if “toast” is a bit too close to Dante’s literal description to be entirely comfortable. But then, intellectual stubbornness has not always been entirely comfortable either. But we need it now more than ever before.